The Drawing object allows shapes, images and text to be created. You can call the following methods on a Drawing object. 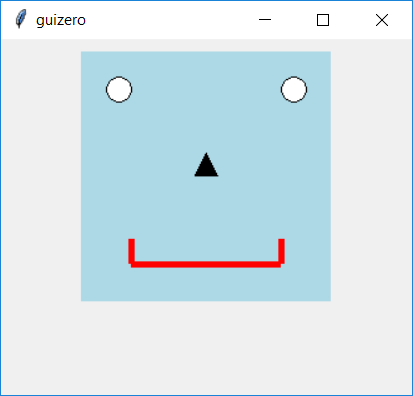 delete() id (int) - - Deletes an "object" (line, triangle, image, etc) from the drawing. image(self, x, y, image, width=None, height=None): x (int), y (int), image (str), width (int), height (int) Id Inserts an image into the drawing at the specified position and returns the id of the image created. line(x1, y1, x2, y2, color="black", width=1) x1 (int), y1 (int), x2 (int), y2 (int), color (str), width (int) Id Draws a line between 2 points and returns the id of the line created. oval(x1, y1, x2, y2, color="black", outline=False, outline_color="black") x1 (int), y1 (int), x2 (int), y2 (int), color (str), outline (int), outline_color (str) Id Draws an oval between 2 points and returns the id of the shape created. polygon(*coords, color="black", outline=False, outline_color="black") coords (list int), color (str), outline (int), outline_color (str) Id Draws a polygon between any number of coordinates passed as pairs of x, y and returns the id of the shape created. 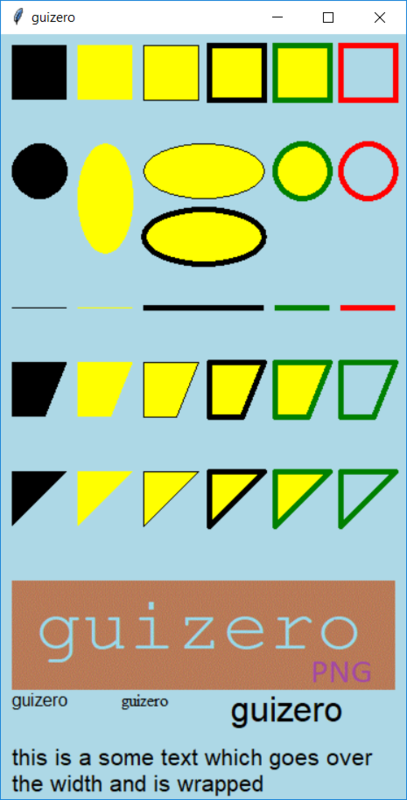 rectangle(x1, y1, x2, y2, color="black", outline=False, outline_color="black") x1 (int), y1 (int), x2 (int), y2 (int), color (str), outline (int), outline_color (str) Id Draws a rectangle between 2 points and returns the id of the shape created. text(x, y, text, color="black", font=None, size=None, max_width=None) x (int), y (int), text (str), color (str), font (str), size (str), max_width (int) Id Inserts text into the drawing at the specified position and returns the id of the shape created. triangle(x1, y1, x2, y2, x3, y3, color="black", outline=False, outline_color="black") x1 (int), y1 (int), x2 (int), y2 (int), x3 (int), y3 (int), color (str), outline (int), outline_color (str) Id Draws a triangle between 3 points and returns the id of the shape created. Refer to a property as <name of widget>.property. For example, if your Drawing object is called drawing you would write drawing.bg. You can set the property (for example drawing.bg = "blue") or get the value of the property to use (for example print(drawing.bg)). Use a rectangle for the face, ovals for the eyes, a triangle for the nose and lines for the mouth.